No. 1 Kaique Pacheco and No. 2 Jose Vitor Leme are both 2-for-2 at the PBR World Finals. Photos: Andy Watson/BullStockMedia.com. 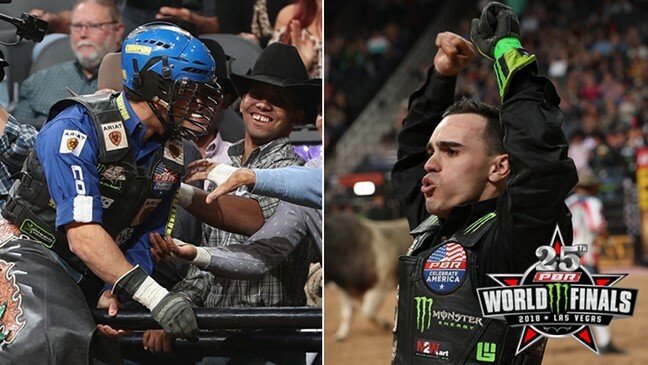 LAS VEGAS – World Champion contenders Kaique Pacheco and Jose Vitor Leme continue to trade blow inside T-Mobile Arena this week. Leme struck first this time in Round 2 by riding Bad Beagle for his fourth career 90-point ride in two trips to the PBR World Finals. The 22-year-old got revenge against Bad Beagle for two consecutive buckoffs and conquered the Phenom Genetics bull for 91 points. Leme finished second in Round 2 for 180 world points and heads into Round 3 sitting No. 1 in the event average. “I was expecting him to do what he did, but even if he didn’t, I was focused to go jump by jump, and I was prepared for him tonight,” Leme said with the help of Paulo Crimber translating. “I knew I was going to win the round or be close, and I just want to thank God for that. Meanwhile, Pacheco continues to fight through his worsening left knee injury. Pacheco had some trouble inside the bucking chutes before taking Smooth Wreck to the 8-second mark for 88.75 points and a fifth-place round finish (75 world points). The 24-year-old leads Leme by 1,347.5 points in the world standings with 2,700 points still up for grabs for either rider to earn. Leme has only gained 187.5 more points than Pacheco through two rounds of competition. There are only four other riders still in contention for the World Championship – No. 3 Claudio Montanha Jr. (-2,130.87 points back), No. 4 Luciano de Castro (-2,321 points), No. 5 Cody Teel (-2,497.5) and No. 6 Ramon de Lima (-2,556.66). No. 7 Cody Nance, No. 8 Cooper Davis and No. 9 Eduardo Aparecidowere eliminated from competition. Pacheco landed on his feet following his ride, which caused his knee to buckle some. The fourth-year pro is 2-for-2 at the PBR World Finals despite tearing his PCL and MCL just five days ago at the 2018 Real Time Pain Relief Velocity Tour Finals. Pacheco has been getting roughly over five hours of therapy a day on his knee. He has been working with Director of PBR Sports Medicine Rich Blyn on a treatment plan pre- and post-event at T-Mobile Arena, while then also getting additional treatment from Jim Bui of Fit-N-Wise Sports Performance back at the Park MGM hotel. The two World Champion contenders’ qualified rides also gave them top draft picks for the Round 3 bull draft. Leme had the second pick in the draft, selecting Bottoms Up, and Pacheco had the fifth pick, choosing Humdinger. The Round 3 draft order was based upon Round 2 results. Pacheco decided to pass on selecting High Razor – a bull he rode for 89 points at the Velocity Tour event in Window Rock, Arizona, in September, to take Humdinger. Leme rode Humdinger for 91.25 points to win the 15/15 Bucking Battle in Milwaukee. However, Leme stuck with his bread and butter with the second overall pick on Thursday night. Leme has ridden Bottoms Up (12-7, PBR UTB) two times for 90 or more points. He first rode Bottoms Up for 90 points at the WCRA Rodeo Showdown in Las Vegas in May three weeks after tearing his left ACL. He then covered Bottoms Up again for 90.5 points to win his first premier series regular-season event this past August.